Have your deck and your patio too! Deck, patio, pergola… No problem. You would be surprised how many Chicagoland area homeowners don’t choose between a deck or a patio. They add both and for very good reason. First, there are a couple practical reasons. If you’re going to add the outdoor living space you’ve dreamed about to your home, add the spaces that really allow you to the outdoor living opportunities you’d like. Both patios and decks have tremendous appeal but their appeal is different. Most decks are elevated and come with the corresponding railing necessary due to the elevation. Most patios are not enclosed and provide an unencumbered feeling that a deck cannot provide. What’s really fabulous about the space you see below is the attention to the vertical details. The deck is surrounded by custom wood skirting and the patio stands atop a glorious hand fashioned stone skirting. Adding to the ascending elevational profile of the 2 spaces stands a custom-made pergola providing partial sun protection to the patio. And, just to make sure evening entertainment on either space is not thwarted, the gently descending steps include deck lighting. 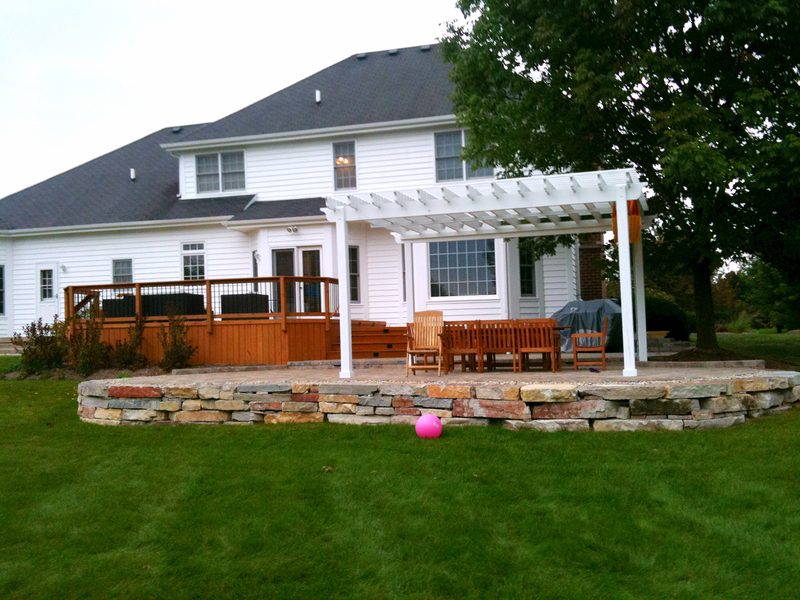 If you are considering adding an outdoor living space to your Chicagoland area home, we would love to hear from you! You can sign up for a Free Archadeck Design Consultation online, give us a call at (847) 496-4333 or send us an email. Our experienced Design Consultants are happy to help you turn your backyard into the ultimate outdoor living destination spot.